President Uhuru kenyatta is set to announce a 3 day period of national mourning for the kenya defense forces soldiers who were killed in the recent attack in somalia last Friday. The president who is currently at the coast is expected to make the statement at the State House, Mombasa. 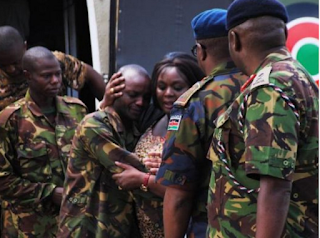 This follows the opposition leader Raila Odinga's request for a two days of mourning period for the slain soldiers. Terror group Al Shabaab ambushed the African Union base in Somalia on Friday, killing a dozen and taking a few others whom the KDF is currently on a mission to rescue. Speaking on the the attack on Monday, Cord leader Raila Odinga said; "Because of the physical and psychological magnitude of this tragedy, we urge that during this period, all flags be flown at half-mast,"
He urged the president to suspend all state activities and converge an emergency meeting to discuss on how to deal with the situation and a way forward. He went on to emphasize that; "Nothing can be more important to our people at this moment. Once again, our prayers are with the families, friends and relatives of the fallen soldiers." There is still no official report from the government concerning the number of casualties from the attack but many have estimated those killed to be between 63 - 100. Yesterday, the KDF are said to have bombed a few Al Shabaab camps, killing a few of the terrorists manning the bases. more than 20 injured soldiers have so far been flown to nairobi for further treatment and more are expected to arrive today and tomorrow. Speaking on the same, Defence cabinet secretary Raychelle Omamo said that the affected families will be compensated. The government has also wanned those sharing the photos of the slain soldiers on social media that they will be dealt with in accordance with the law. Raila now is the president of kenya????? ?